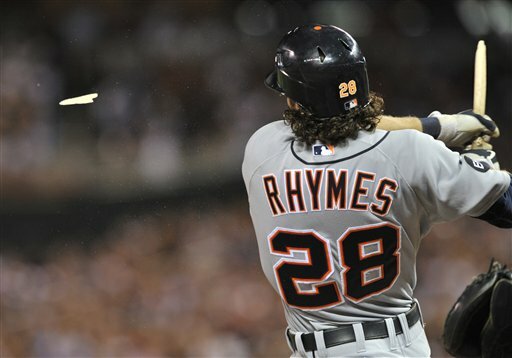 On July 25th, the Tigers called up a player to whom I immediately paid attention for two reasons: his awesome hair and his awesome name: Will Rhymes. Little did I know that this player would also perform well in his first stint in the Major Leagues. Entering play tonight, Rhymes has a nearly league average .321 wOBA in 34 games and 149 plate appearances as a second baseman. Rhymes hasn’t shown much in the way of power – only 9 XBH and no home runs – and he isn’t walking much – 6.7% of plate appearances ending in a free pass. However, Rhymes has shown an excellent ability to make contact in the majors, striking out in only 8% of plate appearances, less than half of the league average of 17%. When he has made contact, he’s done well with it too, as he has a .328 BABIP supported by an excellent 23.3% line drive rate. As a 27 year old with a middling minor league track record, it’s difficult to see Rhymes making any sort of major step forward. His best minor league wOBA in any sort of significantly long stint was .356 in AAA this season before receiving the call up to the Major Leagues, and that was accomplished in a similar way to Rhymes’s MLB line – some walks, very few strikeouts, and good performance on balls in play. This is the first season in which Rhymes has shown this kind of ability to make contact, and as such, ZiPS expects some regression, but not much – still a very solid 14% strikeout rate. There’s likely some regression coming in terms of BABIP too, but I would also expect that Rhymes could hit one or two home runs before the season ends as well. It’s difficult to get a beat on Rhymes’s defense in such a short time – UZR has him as slightly below average, whereas DRS has him at +8 and TotalZone has him at +4. The safest assumption is probably to have him as a roughly average second baseman, which means that he should be able to provide some defensive value for the Tigers going forward. Rhymes’s profile is far form a sure thing to produce at the plate going forward, but right now, he looks like he could become the next Jeff Keppinger. That’s no great shakes, but Keppinger epitomizes the high contact player at the plate and does have two 2+ WAR seasons in the last four years, and that’s despite some poor defense all around the diamond. Rhymes will be an interesting player to watch for the Tigers as they attempt to retool after a relatively disappointing 2010 season. We hoped you liked reading Will Rhymes Solid in Debut Season by Jack Moore! I would like to see the Tigers go with a platoon of Rhymes and Scott Sizemore next year and see which player rises to the occasion w/the opportunity. Despite struggling in 135 PAs, I still think Sizemore will be the guy who seizes that job in the long run. No way the Tigers enter the 2011 season looking to platoon at second base. You need a consistent double play combination at second and SS. No way you get through platooning at either position. It’s either Rhymes, Sizemore, or someone not currently on the roster.. but not a combination.